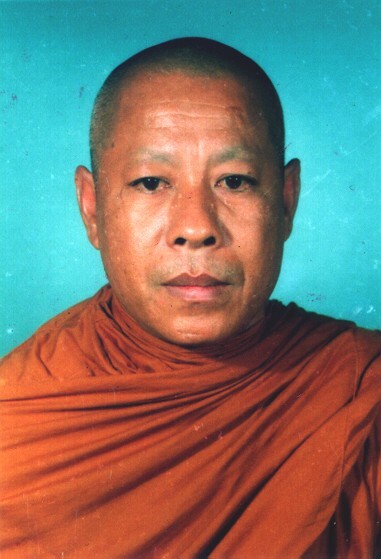 After 20 years of a devastating war in Cambodia, everything must be started over from the beginning: infrastructure, school and health care facilities, etc. People's mentality must be changed as well (knowledge and new ideas, creativity). The needs are both many and great, but assistance is only effective if it is accompanied by social and educational development. Pursuant to the directives of the Ministry of Health, we feel that Kampong Trabek must have a health care center up to contemporary standards. The center has been designated as "Referral Hospital". 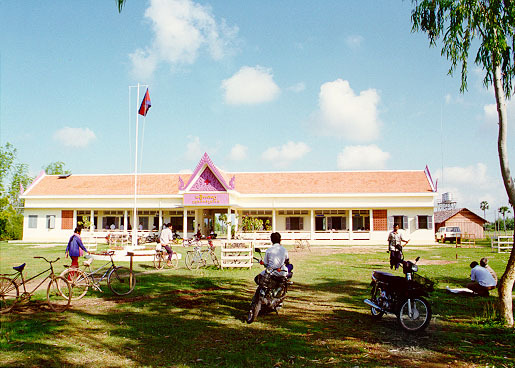 The center is under the juridiction of Cambodian Ministry of Health, with management supervision provided by the Prey Veng Provincial Health Direction. The Ministry looks after staff assignments and provide some basic medication, etc. although we fully realize that they, too, are confronted with financial constraints. We established contact with NGOs and other international organizations to request their assistance (training personel, drugs, equipment, etc.) We are also being helped by private donors whose participation is very previous to us. Any form of support for this public health program would be greatly appreciated. In particular, endowing the center with not only basic materials and drugs (in particular, antibiotics) but also HEAVY EQUIPMENT (radiology, surgical tools, echography, anesthesia, life support, cardiology, laboratory, incinerator, computers, photocopy machines,monitoring, autoclave, etc.) is of utmost importance. 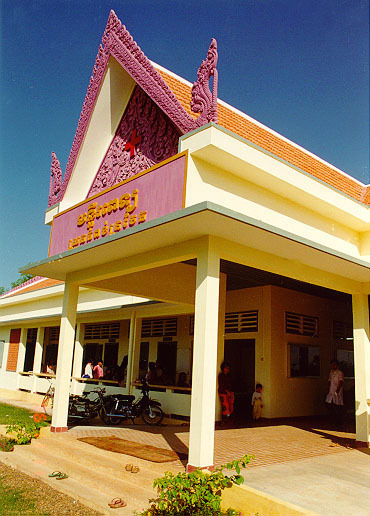 If you would like to visit the Referral Hospital, or to consider making a contribution, please contact Venerable Yos Hut Khemacaro at Wat Langka, Phnom Penh, or see our contacts in France. 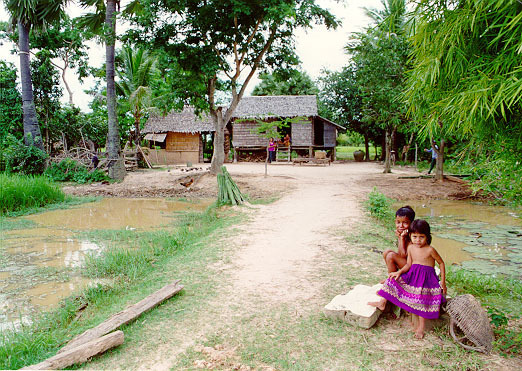 The Prey Veng province is located east of Mekong river, about 90 km south-east of the capital city, Phnom Penh, towards the border with Vietnam. · Population : 946,042 (1998 census data). 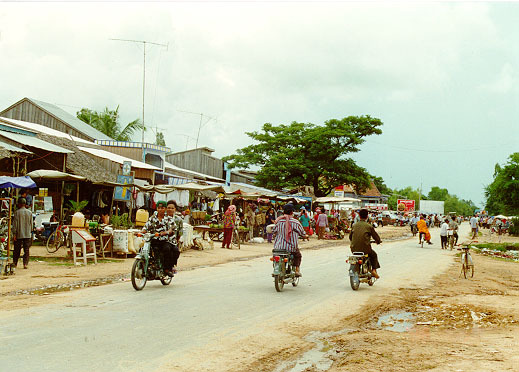 The Prey Veng province, with the third highest population figure in Cambodia, after Kampong Cham, and Kandal, as well as the capital city, has 12 districts (or "srok"). Kampong Trabek is a district in the province of Prey Veng, on National Road 1 which goes on to Vietnam through the province of Svay Rieng. 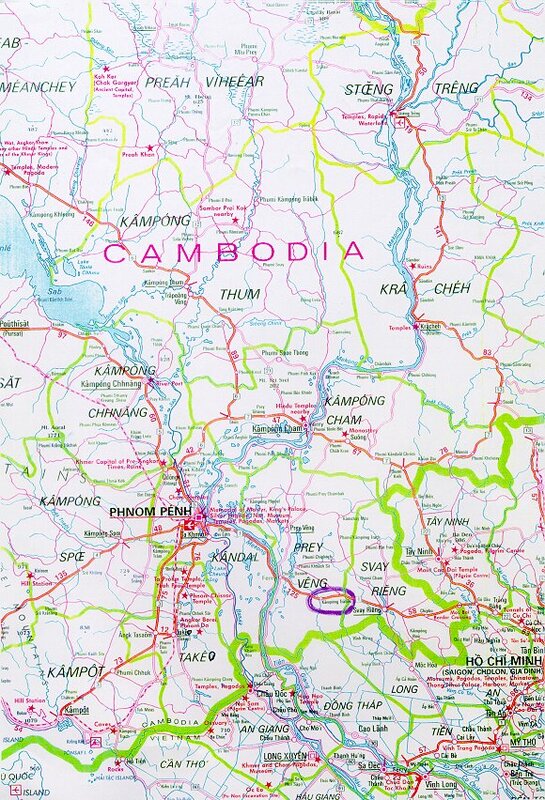 National Road 1 is 166 km long, and Kampong Trabek is 86 km out of Phnom Penh, located at the junction of National Road 1 and the Kampong Trabek river. It has 13 counties (or "khum"). NB: The actual population of Kampong Trabek is 106,555, but a commune of 7,139 inhabitants from a neighbouring district has been put into the Kampong Trabek operational district for purposes of health coverage. Transportation thoroughfares: mainly National Road 1 and small roads leading to Vietnam or to the interior of the province. N.R.1 length is 166 km. N.B. : A distance of 50 km is very far in Cambodia because of road conditions, means of transportation available and the poverty affecting the population at large. The standard of living of the population is very low. The region has been hit by food shortages for many years, with alternating drought and flooding, which only worsen the problem of overpopulation. 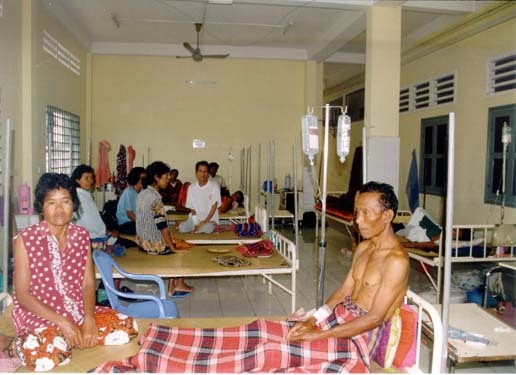 Up to the present time, Kampong Trabek had only an antiquated infirmary station with no rooms or functional areas. The medical staff was made up of a doctor and a few assistants. Basic medication and supplies were inadequate. There was no laboratory. The center could only provide consultations of a general practitioner nature, totally inadequate for the needs of population. In view of prevailing health conditions among the population, it became necessary and urgent to increase the number of consultations that could be handled by setting up more adequate facilities. 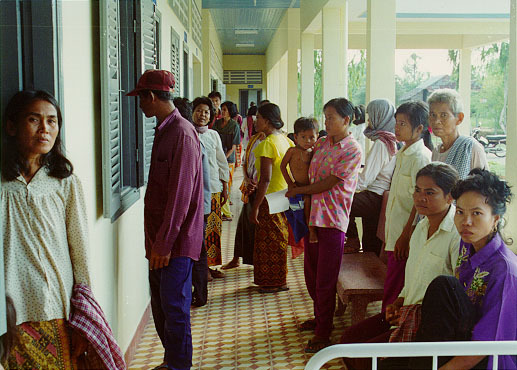 Severely sick patients are evacuated to Neak Loeung, or Phnom Penh, since travel on the road to the main provincial center was more difficult. Officially, the province of Svay Rieng is not supposed to take patients evacuated from Prey Veng, unless the patient comes in personally. Evacuating a sick person by private car is very expensive for families. As of now, we are discussing with NGO and other international organizations to get support (additional staff, education, basic drugs, etc. ), while being well aware that their means are also limited. It is furthermore a matter of importance that the hospital be able to acquire basic equipment, as well as equipment for major health care (radiology, surgical, ultrasound, anesthesia, intensive care, cardiology, laboratory equipment, computers, photocopy machines, etc.). Any assistance that could be given to us would be deeply appreciated, in view of the growing needs of the population. Please check the detailled list of sollicited medical equipment (in French). Our first building, the Health Care Center, the initial phase of our developments (out-patient clinical care, provisional maternity, mother and child care, family planning, vaccination, dentists, etc.) is operational since October 1996. The second building (44 meters long, two stories high) is already begin used: maternity room, general medecine, meeting room, housing, infant and adult hospitalizations. During the first six months of 1999, an operating room, as well as X-ray and ultrasound units (September 1999) were phased in, as the equipment became available. Total construction cost came to $166,000. The annexes (intendance, workshop, garage, kitchen and laundry facilities) have been used since 1996. This center has now become a genuine "Referral Hospital" status. 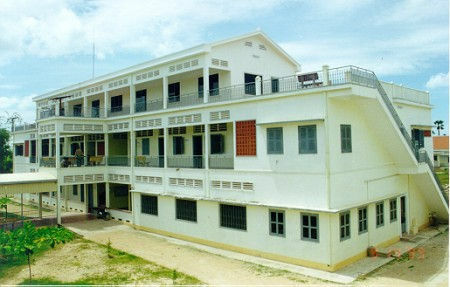 The third building, for tuberculosis, with a length of 46.50 meters, being also of emergency importance, got its operational status in March 1998. The cost was $70.000. 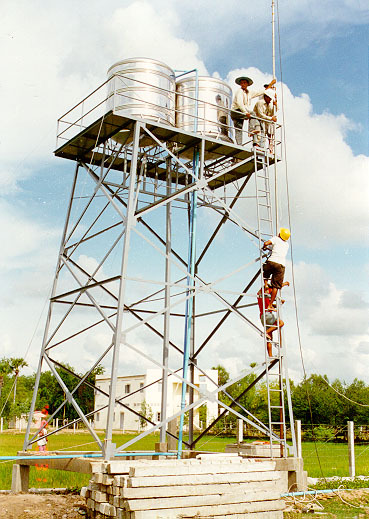 Another building (Building E) became operational in August 1999, at a cost of $45,000. We have an equipped ambulance vehicle ($25.000 with tax exemption). However, in view of a rapid increase in needs, a second ambulance would be a welcome addition. Moreover, we direly need a small truck (for various transportation activities) and a mortuary vehicle for transfers to the crematorium facilities. As of late 1999, total cost for these facilities (health care center, hospital, tuberculosis building and annexes, contribution to operating costs, etc.) amounted to $800,000. We expect this center to eventually offer at least 150 beds. The departments of this hospital would serve a population of at least, and constantly increasing, 200,000, not only from our own district, but neighboring districts as well: the government plan calls for 1 hospital bed for every 1,000 people. The drinkable water supply installation was also completed, including a boosted compressor (Club CODEV de Bugey). At last, for administration and management purposes, we would like to get 3 computers, with their associated printers. A copier would also be useful, as would be radios to connect our medical team with other health centers and hospitals. At this time, donations have enabled us to implement the first and second phases. To bring all the planned construction to completion, we absolutely require financing, logistic support and advice. Any form of support would be deeply appreciated. Work began back in March 1996, and the first building began operating on October 1, 1996 (health care center). It is 40 meters in length and has 13 rooms, along with toilet and shower facilities. The central hallway and main corridor are used as a waiting area. The hospital has a staff of 50 persons (6 in-house doctors, medical assistants, dentists, lab technicians, midwives, nurses, ward personnel and guards). This site is thus already in part operational, as shown for instance in these monthly reports for the surgical unit, covering the 05/25/1999-10/05/1999 period. Of course, there is much left to be done. The cost of putting up this building and annexes (water tower, kitchen, 80 x 170 m fence, as well as start-up equipment) came to 90,000 US dollars. and all our faithful and generous friends from Cambodia, France, Australia, United States and other countries. For more information on this Web page, contact Pierre Jouvelot .